The company Ambi-Budd was founded in 1926 by the American Edward G. Budd Manufacturing Co. and the Ambi Maschinenbau AG (Arthur Müller Bauten und Industriewerke) to make car bodies. Budd transferred the technology of steelbodies that replaced the common wood and sheet covering. 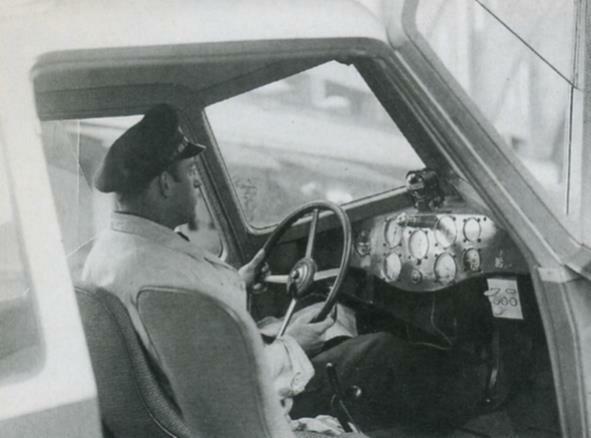 In 1928 the company grow from 800 to 2500 employes and new companies like Ford , BMW and Hanomag became customers. On the site of the former Rumpler-Werke at Berlin-Johannisthal the company Ambi-Budd was established in the early thirties. From 1936 it produced bodies for the Einheits-Pkw of the Wehrmacht. During WW II main production was equipment for the Kübelwagen VW 82 and the Schwimmwagen VW 166 and also the so called Wehrmachts-Einheitskanister. After the war the site was in the Soviet zone and the workshops were dismantled and moved to the Sovietunion. The tools for the BMW 321 went to Eisenach where it continued to be produced for the EMW 321. Beside of the daily production, the company was very open for new developments and made different trials with streamlined bodies. Other pioneering projects , only built as full scale mockups were built. 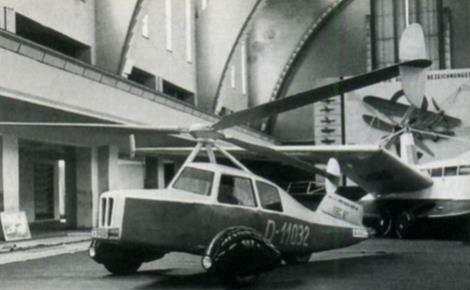 To this category was the “Autoflugzeug” made for the Deutsche Luftfahrtausstellung (Dela) in Berlin 1932. 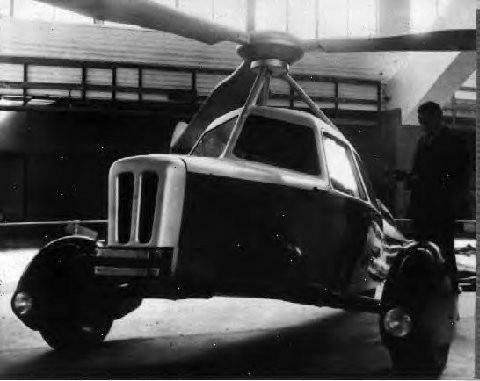 The design was thought to be a combination of car and aircraft able to be used as a car on the roads and to by using a rotor like a helicopter to fly. The body was like a fuselage with a fin while the three-bladed rotor with end caps was attached to a three legged structure. No tail rotor, probably was some kind of tip drive to take care of the torque. Three-wheeled landing gear, two wheels in front with streamlined covers and a tail wheel. Weight empty calculated to 450 kg, load 450 kg , and flying weight 900 kg. Speed and ceiling would be low. A venture for measuring the speed is placed on left side of the fuselage like in gliders. Registration both for a car (Berlin sign IA-011032) and aircraft (D-11032). The four seat cabin looks like a comfortable car and was fully equipped on the mockup.The equipment and the instrumentation was like for a light sportplane and looked very realistic. The company Askania made all this instruments available. The “Autoflugzeug” was just a dream or workshop joke. It did not move forward on the ground , had to be lifted. But it was a very successful exhibition object. After the exhibition it went back to Ambi-Budd and later to the Aviation museum in Berlin. It was destroyed during the war.